Eric Bumpus and Tim Moranville talk with Dan Merchant, who has made a documentary that perfectly fits with the mission of CeaseFireStrategies. 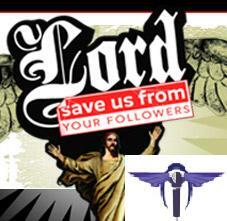 Lord, Save Us From Your Followers chronicles the cross country trek of 'Bumpersticker Man' (Dan Merchant), who is trying to answer the question, 'Why is the Gospel of love dividing America?'. From the 'apathetic Protestant' to the 'concerned Atheist'; Dan sorts through America's view of Christians and Christianity.